This will set your memory limit to 16 MB, rather than 8 MB. You can, and should, fiddle with this number so that it is as low as possible without repeating that error message. This will only alter the memory limit for that particular PHP file. I’ve noticed in my own PHP.ini file that my default is much higher at 128M. So, if I were to ever receive this error message it would read: “Fatal error: Allowed memory size of 134217728 bytes exhausted…” and obviously be a much bigger problem. But it has the same workaround as “Fatal error: Allowed memory size of 8388608 bytes exhausted…” or “Fatal error: Allowed memory size of 16777216 bytes exhausted…” or whatever. Apparently, the memory_limit default was upped from 8M to 16M in PHP 5.2.0 and is now 128M for PHP 5.3.0, which would explain why you may not get this error message at all. 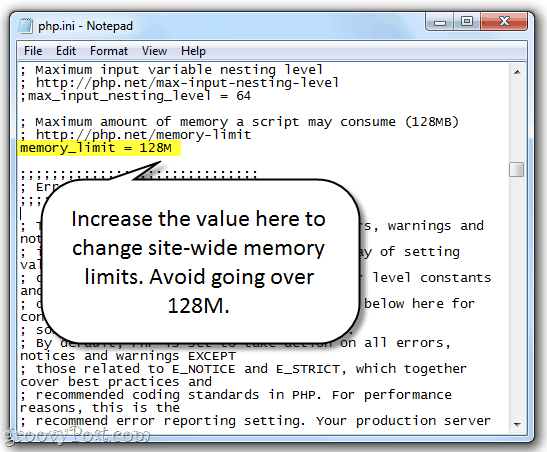 You can also disable the memory limit by setting memory_limit to –1 in PHP.ini. This isn’t usually a good idea, though, for obvious reasons. Note: You can also use the memory_limit line in your .htaccess page. If you’re getting this error message in Drupal or Joomla, the likely culprit is a new module or package. For example, in Drupal, the admin/modules page loads every module in your Drupal installation, which can get hairy if a custom module is buggy, corrupt or hacked. Try disabling modules one by one to identify which is bringing the party down. Also, some hosting providers will ignore your attempts to modify the memory limits for your PHP code so you might need to contact your hosting support to assist you. I’ve found sometimes I need to edit the php.ini file and sometimes put the code into the .htaccess file. Either way, hopefully this info here is enough to get you on your way! This is useful information, although slightly confusing. As the filenames you mention, do not match the images. In addition, I do not have a content.php file on my server. I just used content.php as an example. 1. Add ini_set(“memory_limit”,”16M“); to the beginning of your individual PHP file that causes the error. For example, if index.php is causing the error, add < ?php ini_set(“memory_limit”,”16M“);?> to the top of index.php. This will only apply the memory limit change to that file. 2. 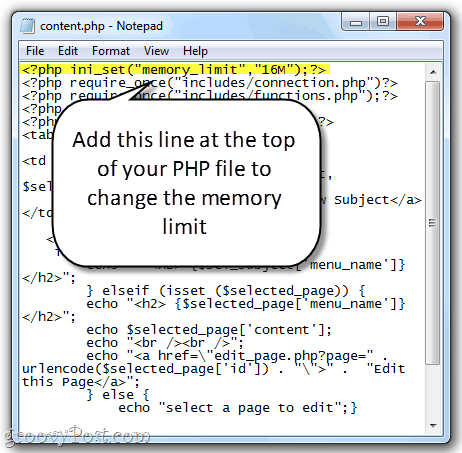 Change the memory_limit= line in your php.ini file. You may not have access to this, depending on your web hosting package. You may need to contact your administrator. This is a site-wide change that affects your entire PHP installation. 3. Add the memory_limit= line to your .htaccess file (or create a .htaccess file and put it in the folder where you want it to be applied). This may be a better option if you don’t have access to php.ini. This will be a directory-wide change. Say, if you add it to the .htaccess file of yourwebsite.com/section1 it’ll only affect php files in the /section1 subdirectory. What exact line do I add in the .htaccess file? It returned an internal server error. This didn’t work either. it returned again an internal server error. I also tried recommendations 1 & 2, I got the same fatal error message. What other free solutions can I explore please? Really need your help. Hey Karen, you are a life saver. i was on the same problem for 2 days myself. after research page after research page, i come across yours and it worked. great job. has to do with installing http://www.rockmelt.com which is based on google chrome which i have installed with no problem. but un-fortunately it didn’t work..i think it may have been the same link that rockmelt.com sent me..but thanks for the reply. @Marvio – your welcome. Thnx for the comment and welcome to groovyPost. What is your name that plugin reply comment? It is marvelous for community wordpress. Please what’s your plugin? I was facing the problem of script size that have removed by using the first technique mentioned on top of the page. These are really very nice and helpful posts. @Irfan – Excellent. I’m glad we could help and thanks for the feedback! but where is the file located? Thanks. I hope this solves my problem as it is creeping into my overnight export cron job. I’m trying to set up a Joomla website LOCALLY by using a quickstart Responsive template (LightHouse). 1st of all, I got the Fatal error: Allowed memory size of 8388608 bytes exhausted, WHICH HAS BEEN SOLVED BY YOUR METHOD. Then I put a .htaccess file in the directory where the problem was generated and nothing happened. It help me a lot, thank you very much. I added to same to the .php but this is not resolving. This actually happens when I activate the Google Fonts wordpress plugin.